Here are the top ten examples of corporate welfare and welfare for the rich. There are actually thousands of tax breaks and subsidies for the rich and corporations provided by federal, state and local governments but these ten will give a taste. One. 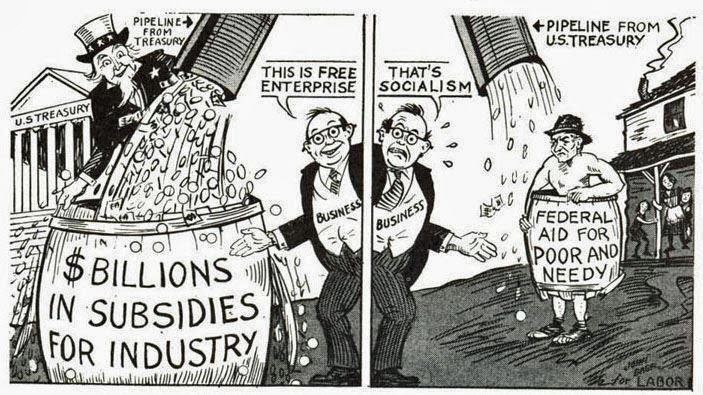 State and Local Subsidies to Corporations. An excellent New York Times study by Louise Story calculated that state and local government provide at least $80 billion in subsidies to corporations. Over 48 big corporations received over $100 million each. GM was the biggest at a total of $1.7 billion extracted from 16 different states but Shell, Ford and Chrysler all received over a billion dollars each. Amazon, Microsoft, Prudential, Boeing and casino companies in Colorado and New Jersey received well over $200 million each. Two. Direct Federal Subsidies to Corporations. The Cato Institute estimates that federal subsidies to corporations costs taxpayers almost $100 billion every year. Three. Federal Tax Breaks for Corporations. The tax code gives corporations special tax breaks which reduced what is supposed to be a 35 percent tax rate to an actual tax rate of 13 percent, saving these corporations an additional $200 billion annually, according to the US Government Accountability Office. Four. Federal Tax Breaks for Wealthy Hedge Fund Managers. Special tax breaks for hedge fund managers allow them to pay only 15% rate while the people they earned the money for usually pay 35% rate. This is the break where the multimillionaire manager pays less of a percentage in taxes than her secretary. The National Priorities Project estimates this costs taxpayers $83 billion annually and 68% of those who receive this special tax break earn more than $462,500 per year (the top one percent of earners). Five. Subsidy to Fast Food Industry. Research by the University of Illinois and UC Berkeley documents that taxpayers pay about $243 billion each year in indirect subsidies to the fast food industry because they pay wages so low that taxpayers must put up $243 billion to pay for public benefits for their workers. Six. Mortgage Deduction. The home mortgage deduction, which costs taxpayers $70 billion per year, is a huge subsidy to the real estate, banking and construction industries. The Center of Budget and Policy Priorities estimated that 77 percent of the benefit goes to homeowners with incomes over $100,000 per year. Seven. The billions above do not even count the government bailout of Wall Street which all parties have done their utmost to tell the public they did not need, they paid back, or it was a great investment. The Atlantic Monthly estimates that $7.6 trillion was made available by the Federal Reserve to banks, financial firms and investors. The Cato Institute estimates (using government figures) the final costs at $32 to $68 billion, not including the takeover of Fannie Mae and Freddie Mac which alone cost more than $180 billion. Eight. Each major piece of legislation contains new welfare for the rich and corporations. The Boston Globe analyzed the emergency tax legislation passed by Congress in early 2013 and found it contained 43 business and energy tax breaks worth $67 billion. Nine. Huge corporations which engage in criminal or other wrongful activities protect their leaders from being prosecuted by paying huge fees or fines to the government. You and I would be prosecuted. These corporations protect their bosses by paying off the government. For example, Reuters reported that JPMorgan Chase, which made a preliminary $13 billion mortgage settlement with the US government, is allowed to write off a majority of the deal as tax deductible, saving the corporation $4 billion. Ten. There are thousands of smaller special breaks for corporations and businesses out there. There is a special subsidy for corporate jets which cost taxpayers $3 billion a year. The tax deduction for second homes costs $8 billion a year. Fifty billionaires received taxpayer funded farm subsidies in the past twenty years. > The article above was written by Bill Quigley and first appeared on the CounterPunch website. Bill Quigley is a law professor at Loyola University New Orleans and can be reached at quigley77@gmail.com.